Children are naturally inquisitive, so don’t be surprised when they want to explore the big wide world that is your home and venture towards electrical items. However, we do want to keep them safe, and in our new article, we discuss ‘How to childproof your home’s electrical outlets’, read to find out more! Children always feel compelled to try and fit their tiny fingers into small and potentially dangerous places, and it is our jobs to ensure that they are kept safe from any impending doom, that’s why in our article we explain how you can ensure electrical items are kept covered and out of the reach of children. To find out more, read on! Outlets can be tempting for children for some reasons, one being that children are curious of course, and another may be that outlets look like little faces and children find that fascinating, but little do they know, they can be deadly. Your child may think putting in keys or coins into these electrical outlets is a fantastic idea, but they are at risk of getting electrocuted. It is a known fact that up to 2,400 workers suffer from electrical burns and severe shocks by inserting items into electrical outlets. 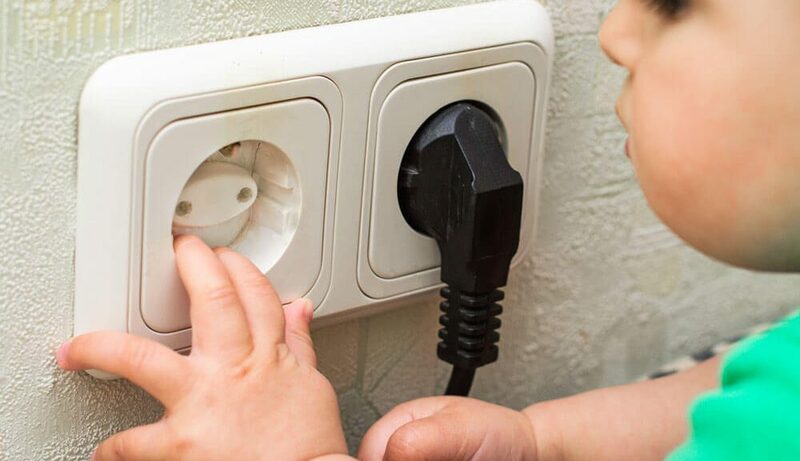 So in conclusion electrical outlets and children do not mix but before you go out and purchase baby proofing products, it is important to know what type of electrical outlets you have and how to protect your child from them. 1. Regular electrical receptacle : Older houses – precisely houses built before 2008 – contain a regular electrical receptacle. These electrical outlets contain three open slots making it easy for your child to insert anything small and putting themselves at risk. Fix: To help protect your baby from the regular electrical receptacle, there are electrical outlet caps available at very low prices. These plastic caps plug directly into the socket preventing your child from inserting anything inside and are made in plain colours as to not attract attention. However, their flat surface makes it harder to remove them in the chance that you do want to use the outlet. 2. Tamper resistant electrical receptacle: These outlets contain plastics inside two of the slots to prevent your child from poking in there. These outlets only open if they are pushed simultaneously like if you were inserting a plug, and since a baby is incapable of pushing two things in the slots at they same time, they are much safer. However, only two of these slots are covered by the plastic, so one is left exposed, this still leaves your child at risk and protecting them from all electrical outlets is what we are aiming for. Fix: The electrical outlets are much safer than the standard ones, but the risk of one slot being exposed is still there. To protect your child you could again, purchase an outlet cap, or you could opt for an outlet plug. Like mentioned before, outlet cap’s flat surface makes it hard for you and your child to remove it, and outlet plugs solve this problem as the surface it not as flat, making it easier for you to remove them but still making it difficult for your child to remove them. However, when it comes to price, outlet plugs are a little more expensive than outlet caps, but it seems to be a worthwhile investment. Here at In2 Electrical we specialise in Testing and Inspecting in Bedford so we can send in our expert electricians to test and inspect your home and give you valuable information on how to keep you and your family safe from any possible electrical danger. Keeping your child safe from electrical outlets is paramount if you want to shelter them from serious danger. You can do this by using outlet caps or outlet plugs which were mentioned before, and you are sure to keep your child protected!